Find artworks, auction results, sale prices and pictures of Adolf Friedrich G. Wichmann at auctions worldwide. The present painting is the work of the German history and genre painter Adolf Friedrich Georg Wichmann, and dates from the middle of the 19th century. 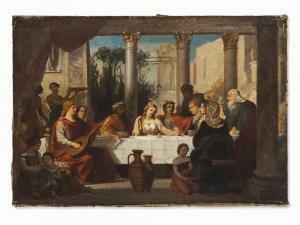 It depicts an antique style Roman wedding feast. The wedding guests are gathered around a white table located in an atrium with Corinthian columns. In the center is depicted the beautiful bride with flowers in her hair, illuminated by the sun. She is embraced by her husband, who wears a laurel wreath and a red cloak. He seems to touch glasses with the bride's father. A lute player provides the musical accompaniment. Some children sitting on the floor and working staff surround the table. The painting is mounted in a partly gilt stucco frame. Verso on the stretcher, there is a label indicating \‘Adolf Wichmann/Nachlass\’\’\’\’. The paint surface shows major crackle in the central image background and some areas of abrasion. Inspection under UV light reveals minor retouching to the central craquelures, as well as several areas of retouching affecting the background, the edges and the figure. The frame shows minor wear. The overall dimensions, framed, are 53 x 71 cm. The stretcher measures 42 x 60.5 cm. 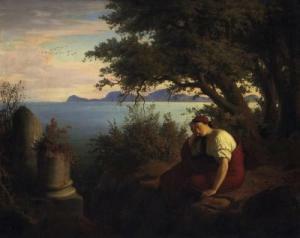 The painting was originally a part of the estate of the sculptor Rudolph Hölbe, who was married with the artist's daughter, Sophie Wichmann. It was there acquired by the present owner. 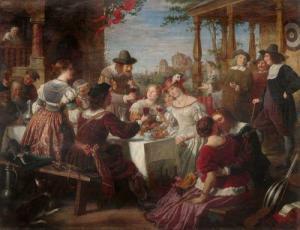 Friedrich von Boetticher, Vol II (1979) mentions as Wiechmann/N° 10 a painting titled \‘Hochzeitsmahl\’\’\’\’ [Wedding Feast]. 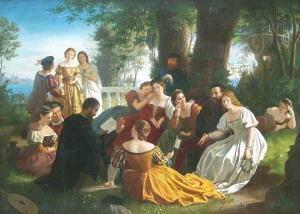 Born in Celle, Adolf Wichmann was as student of the Dresden Academy from 1838. He was trained in Professor Eduard Bendemann\’\’\’\’s studio until 1847. From 1847 to 1851, he lived in Venice and Rome. He later settled again in Dresden. Since 1862, Wichmann was a teacher of the lower class at the Dresden Academy. "Meine Frau". Female model. Unsigned, on the reverse indicated Adolph Wichmann nachlass. Oil on paper laid on panel. 37 x 34 cm. 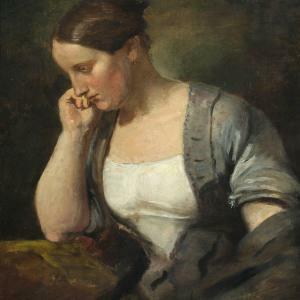 In this encyclopedia the most significant painters of the 19th century are mentioned and some of their major works listed with numbers, among which paintings by Wichmann. Tear in upper left corner. Retouches.